Enjoy the amazing taste and benefits of honey and support FEBC at the same time. This Nelson Honey gift pack is a delicious and great value way to stay healthy, happy, and support missions! Enjoy Manuka Honey with its antioxidants, antibacterial, and digestive health properties. Honeydew’s intestinal health and digestive qualities. And West Coast honey’s mild flavour and floral variety. 3 x 250g containers. The Gift pack is an assortment of Honeydew, West Coast, and Manuka honeys in 3 x 250 gram jars. 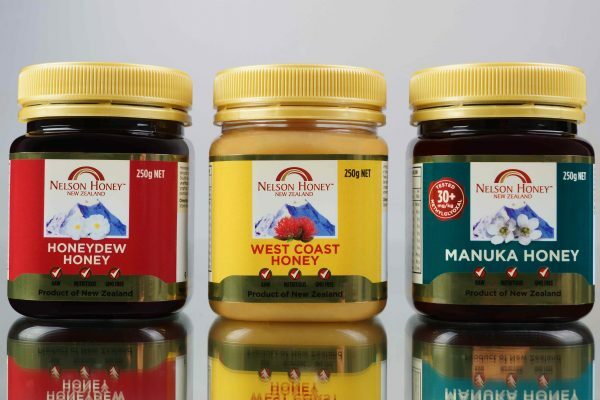 A great way to enjoy the goodness of three famous and healthy New Zealand honeys. Honeydew is dark in colour, with a similar taste to golden syrup or treacle. This runny honey does not crystallise in cooler temperatures and is delicious with plain yoghurt, on toast, in drinks (smoothies!) or with your cereal each morning. Honeydew Honey contains complex sugars called Oligosaccharides which research shows may support and strengthen good intestinal bacteria and digestive functions. These Oligosaccharides may be especially beneficial to people suffering from colitis or those taking antibiotics which are renowned for killing all the good bacteria in the intestinal tract. Honeydew Honey also contains higher levels of antioxidants compared to other floral honeys. Nelson Honey’s owner Phil calls our West Coast Honey a ‘Fruit Bowl of Honeys’ and with that he’s referring to the wide range of native floral sources that make up our West Coast Honey. West Coast Honey is mild flavoured, lightly coloured and a popular choice for children and adults alike. Great on toast, added to a glass of hot water, in baking or just by the spoonful! 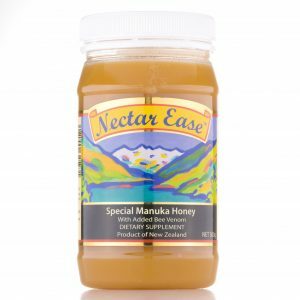 Manuka Honey 30+MG is sourced from pure, clean and unpopulated natural environments in remote parts of the top of the South Island of New Zealand – free of pollution, chemicals and other contaminants. This special quality of Manuka honey is very rare and we are proud to share it with the rest of the world! 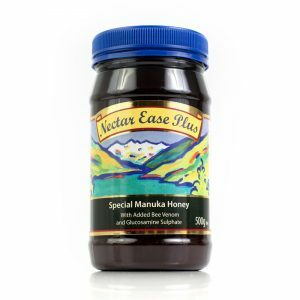 Manuka honey is a monofloral honey collected by our honeybees from the Manuka flower. The honeybees collect and transform the nectar of the Manuka plant into honey by combining various digestive enzymes through a unique process. This naturally sweet Manuka Honey is rich in natural antioxidants and antibacterial properties. This Manuka Honey contains low levels of MG. Our 30+ grading system means it contains more than 30mg per kg of Methylglyoxal (MG).